Prefabrication is now an accepted way of constructing a home. The process is simple and straightforward. We assemble the components at a manufacturing site and then transport these components to the construction site. There used to be the perception that prefabricated homes were not as desirable as traditionally built homes but that myth has now been debunked. Now, prefabricated homes are a viable solution to providing New Zealand with quickly made, high-quality homes. There are many benefits to this method of construction. Here are five advantages of the prefabrication process. Prefabricated construction means financial savings. Components are created in a controlled environment rather than on a construction site. This environment allows better material planning, which reduces surplus. The less you need to store, the more you save in storage costs. Also, there is less likelihood of materials being damaged. Prefabricated homes take less time to build than on-site constructed homes. In many cases, prefabrication takes less than half the time of traditional construction methods. The shorter construction time is due to eliminating weather disruptions, more precise planning and quicker fabrication as multiple modules can be constructed at the same time. Typically, a prefabricated kitset home can be completed within two weeks and then transported to the construction site. Prefabrication greatly reduces the demand for energy and raw materials. The efficiency with which components can be made means that prefabrication can provide New Zealand with the housing it desperately needs whilst minimising the effect on natural resources. The prefabrication process is safer than traditional construction methods for builders. With most construction done in a controlled environment, there is less environmental hazards and risk of accidents. Prefabricated homes are constructed using plans with exact specifications on procedures and materials so the finished structure is consistent with your design preference. We use CNC technology so we can ensure the highest degrees of accuracy. 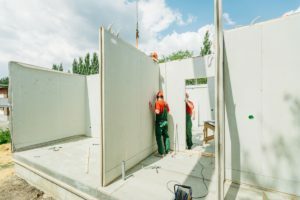 Compared to traditionally constructed homes, prefabricated homes go through more initial wear and tear from transporting the modules to the construction site and craning these components onto a home’s foundations. Considering these scenarios, each module has to be made more durable in order for the completed structure to satisfy building standards and policies. With heavy-duty modules, prefabricated homes can have the same or a higher level of quality compared to a traditionally constructed home. At Durapanel, we are passionate about the prefabrication process being the future of the construction industry in New Zealand. Our prefabricated home kits are innovative products that are both sustainable and flexible. We frequently redefine what is possible with our prefab kitset homes by helping builders solve many construction issues. We continually apply new systems to eliminate unnecessary costs and time, but never at the expense of providing quality solutions to our clients. For any enquiries about our prefab homes, call us on 0800 387272.